Singapore is often referred to as a concrete jungle but, if you know where to look, there’s a lot of nature to be found too. The beautiful Singapore Botanic Gardens became our first UNESCO Heritage Site in 2015 and although it made us appreciate our green spaces a little bit more, there are many other parks and gardens around our island that are spectacular too. One of the largest freshwater marshes in Singapore, you’ll find a rich array of flora and fauna here. Birdwatchers will especially love it here as you’ll find more than 170 species of birds such as woodpeckers and the majestic Changeable Hawk Eagle. There are other creatures to spot here too such as monitor lizards, as well as 54 species of butterflies and 33 species of dragonflies. Make it to the top of the Raptor Tower and enjoy the view of the surrounding marshes and Kranji Reservoir – we guarantee you won’t for a second remember that you’re actually in Singapore. Cycling is not allowed in the area but you may cycle there and park your bike at Kranji Gate. Also, because of the rugged terrain, do make sure you have proper footwear on and keep to the designated trails. To start, head to Kranji Gate, 11 Neo Tiew Lane 2, Singapore 718814. Map here. More info here. The sight of water is always soothing so this park is ideal for enjoying a relaxing walk or cycle. It’s amazing how this park is so near the housing estate, yet it’s filled with lush greenery and will also give you a nostalgic feel of the way the old Punggol used to be. There are four themes at this park: Green Gallery, Recreation Zone, Heritage Zone and Nature Cove. The Green Gallery is perfect for a walk as you admire the flora and fauna, while Heritage Zone will give older visitors a blast from the past, as you walk down the heritage path and come across the mature trees and vegetation. Fun fact: The word ‘Punggol’ in Malay means ‘hurling sticks at the branches of fruit trees to bring them down to the ground’; this isn’t a random name though, it’s a reference to the area’s history as a fruit-growing district or as a rendezvous for wholesale fruit agents. Punggol Waterway Park is along Sentul Crescent, Singapore 821313. This is one of the first forest reserves to be created in Singapore, dating all the way back to 1883. So you won’t just be walking or hiking, you’ll also get a history lesson while you’re there. Traverse along the original vegetation and undisturbed tropical forest that existed before Sir Stamford Raffles landed in Singapore. The reserve is also home to one of the richest and most diverse ecosystems in the world, thanks to our location on the equatorial belt. It’s also where you’ll find around 40 per cent of our country’s native flora and fauna so it is especially recommended for anyone interested in vegetation. Of course, Singapore’s highest hill, Bukit Timah Hill (standing at 163m), is also there. You could trek up the hill or choose from the many walking and biking trails around the reserve. Bukit Timah Nature Reserve is at Hindhede Drive, Singapore 589318. Map here. 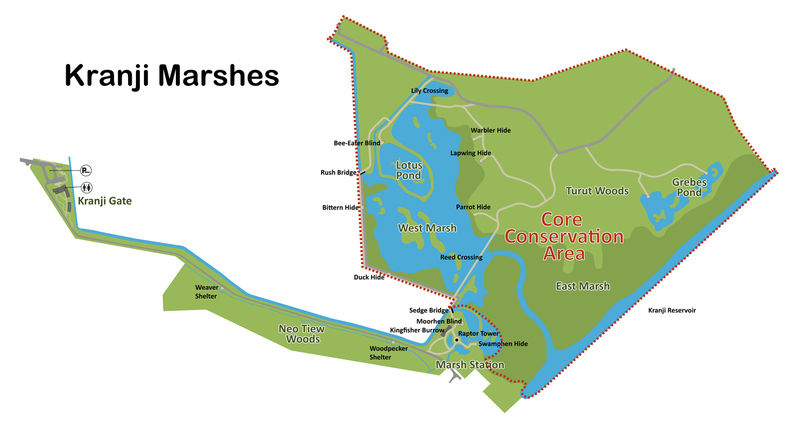 This area comprises 10km of green open spaces that connect Mount Faber Park, Telok Blangah Hill Park, HortPark, Kent Ridge Park and Labrador Nature Reserve. It’ll take you three to five hours to walk through the whole area but it’s probably best to take your time and do them in bits so that you can truly appreciate your surroundings. Because there truly is a lot to see here – highlights include Henderson Waves, a wave-like structure consisting of a series of undulating curved ‘ribs’ and is the highest pedestrian bridge in Singapore, and the Marang Trail, which leads you to the top of Mount Faber. There are several trails including some very impressive park connectors, which means you’ll have no issues figuring out where you’re going. Take a walk to boost your health, a ‘kaypoh’ trip just to see what kinds of nature you’ll find here, a day out bonding with family/friends, or just a trip exploring the area to make your Instagram followers jealous of the dazzling photos you’ll be posting. It’s one of the best spots on our island to get stunning panoramic views of the city, harbour and the Southern Islands. To start, head to Mount Faber Park and go up the Marang Trail. Use these routes as a guide. More info here. This is one of two ASEAN Heritage Parks in Singapore, the other being Bukit Timah Nature Reserve. Regular visitors here include kingfishers, herons and egrets but birds aren’t the only animals you’ll find here. There are many trails to trek across and your stroll along the 500-metre-long boardwalk of the mangrove swamps will introduce you to unique creatures like tree-climbing crabs and mud lobsters. You’ll also come across the Aerie Tower along the trail, a highlight for birdwatchers as it’s the perfect spot to observe various migratory birds during certain months. There are free guided walks every Saturday at 9.30am (registration is required, more info here) if you’d also like to find out more about the reserve. To start, head to its Visitor Centre at 60 Kranji Way, #01-00, Singapore 739453, or its Wetland Centre at 301 Neo Tiew Crescent, Singapore 718925. More info here. Map here. Located off Venus Drive at Upper Thomson, the 75ha Windsor Nature Park features freshwater streams, a marsh habitat and offers three easy boardwalk trails. Part of the 2.2km Squirrel and Drongo Trails include a 150m-long treetop walk that lets you trek through fauna found at the canopy level some four metres high. For families with strollers in tow, the flat 350m Hanguana Trail lined with rare native plants is your safest option. Windsor Nature Park is at 30 Venus Dr, Singapore 573858. One of the most popular spots for walking, hiking, running or simply enjoying nature, this park also border’s our country’s first reservoir. Many of us went to MacRitchie for our school cross-country events and thus are familiar with it but there are so many things to enjoy here to get away from city living. Take a walk along MacRitchie Trails, a 11km nature trail loop that circumnavigates the reservoir. Don’t be surprised if you meet some long-tailed macaque monkeys or monitor lizards. But if you want to aim higher (literally!) try the Treetop Walk, where you’ll enjoy a birds-eye view from a 250-metre aerial free standing suspension bridge spanning the two highest points (Bukit Peirce and Bukit Kalang) within MacRitchie. You could also take a hike within the forested areas; there are 3.2km and 4.8km trails to choose from. MacRitchie Reservoir Park is along Lornie Road, Singapore 298717. Escape the city and head towards Pulau Ubin to explore Chek Jawa Wetlands and the 74m-high Puaka Hill. Puaka Hill involves an arduous climb up a rocky path, but the view of the granite quarry filled with cobalt-tinted water, and the Malaysian borders, is quite a stunner. Meanwhile, Chek Jawa is an intertidal area and is one of the country’s richest ecosystems. Amenities installed in recent years include a visitor centre with a viewing jetty, more than 1km-long boardwalks, and the 20m-tall Jejawi Tower. A boat ride to Pulau Ubin costs just $3 per trip. This park was developed on an abandoned quarry site in 1988 and it’s so serene, making it the perfect distraction from the hustle and bustle of modern life. Stroll, run or hike through the various trails; depending on which route you choose, you’ll be making your way through the forest on meandering footpaths or undulating terrain. What they all have in common is the tranquil feeling you’ll get while on your journey. There are look-out points that offer beautiful views of the quarry. But there are lovely views even on the ground, such as the picturesque pond at the entrance, which lies at the foot of a high cliff wall. Don’t forget to pay your respects to the victims and soldiers of World War II at the Bukit Batok Memorial. Bukit Batok Nature Park is along Bukit Batok East Avenue 2 and Bukit Batok East Avenue 6. Map here. Located in the city centre, this park has been a silent sentinel that has stood through the ups and downs in Singapore’s history. Sights along its historical 2km-long trail include Raffles House and Raffles Terrace (named after Sir Stamford Raffles’ first bungalow), fort walls, an underground bunker, and the country’s first Christian cemetery. Fort Canning Park is at River Valley Rd, Singapore 179037. The 63ha park features an easy 1km trail known as the Wallace Trail, which will take one through a dense forested area to view remnants of houses and wells of a kampung (village in Malay), meandering streams and durian fruit trees. Also in the same vicinity is the Dairy Farm Quarry, where the vertical granite walls are popular among rock-climbing enthusiasts, and Singapore Quarry, which has been transformed into a wetland habitat with a viewing platform. Dairy Farm Nature Park is at 100 Dairy Farm Rd, Singapore 679057. Accessible from Punggol Promenade Punggol Point Walk, the tranquil 50ha Coney Island is home to five different beach areas, a mangrove boardwalk, three bird-watching hides, an adventure area, and a never-ending sight of lush green trees. There’s also an adventure area at the start point, which is made up of fallen Casuarina trees. While the paths are certainly walkable, cycling would be a better, and quicker way to explore the rugged terrain. 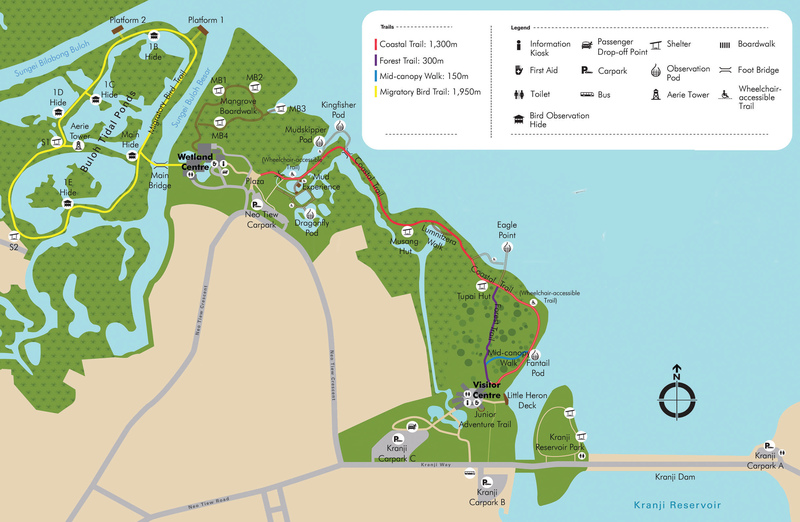 Coney Island is located beside Punggol Promenade Nature Walk. Get more access information here.